Death and Taxes is one of my favorite decks to play and one of my least favorite decks to play against. This is my version of Derevi that takes all the aspects of Death and Taxes that I enjoy and combines them into a mix of flicker and lockout that just makes for an awesome EDH game. I have listed a number of the infinite combos below (knowing that I didn’t get them all) but these should provide some good ideas of what this deck can do. 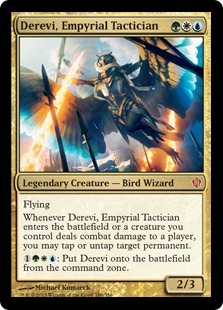 Derevi, Empyrial Tactician + Bloom Tender + Ashnod's Altar = Infinite colorless mana. Derevi, Empyrial Tactician + Deadeye Navigator + Gilded Lotus = Infinite colored mana. Derevi, Empyrial Tactician + Fertile Ground + Dawn's Reflection + Ashnod's Altar = Infinite mana. Derevi, Empyrial Tactician + Fertile Ground + Dawn's Reflection + Altar Of Dementia = Infinite mill. Derevi, Empyrial Tactician + Dawn's Reflection + Earthcraft + Ashnod's Altar = Infinite colorless mana. Derevi, Empyrial Tactician + Dawn's Reflection + Earthcraft + Altar Of Dementia = Infinite mill. Derevi, Empyrial Tactician + Dawn's Reflection + Earthcraft + Blasting Station = Infinite damage. Earthcraft + Squirrel Nest = Infinite squirrels. Earthcraft + Squirrel Nest + Blasting Station = Infinite damage. Earthcraft + Squirrel Nest + Ashnod's Altar = Infinite colorless mana. Earthcraft + Squirrel Nest + Altar Of Dementia =Infinite mill. Deadeye Navigator + Palinchron = Infinite mana. Deadeye Navigator + Palinchron + Acidic Slime = Destroy all artifacts, enchantments and lands. Deadeye Navigator + Palinchron + Memnarch = Take control of everything. Deadeye Navigator + Palinchron + Mulldrifter = Unlimited draw. Deadeye Navigator + Palinchron + Eternal Witness = Return all cards in graveyard to hand. Deadeye Navigator + Palinchron + Draining Whelk = Counter all spells. Deadeye Navigator + Palinchron + Venser, Shaper Savant = Counter all spells and return all permanents to their owner’s hands.